On our last day in Geneva, we had breakfast at Le Sud of the Mandarin Oriental Hotel du Rhone – I had a perfectly baveuse (runny) omelette aux fines herbes (omelet with fresh herbs), fresh orange juice, double espresso and crusty mini-baguettes. Afterwards, we took the train at noon to Vevey where we were meeting up with my brother in-law and family for lunch. J met us at the train station then we went to to see their new home before heading back down to Montreux for some lunch. 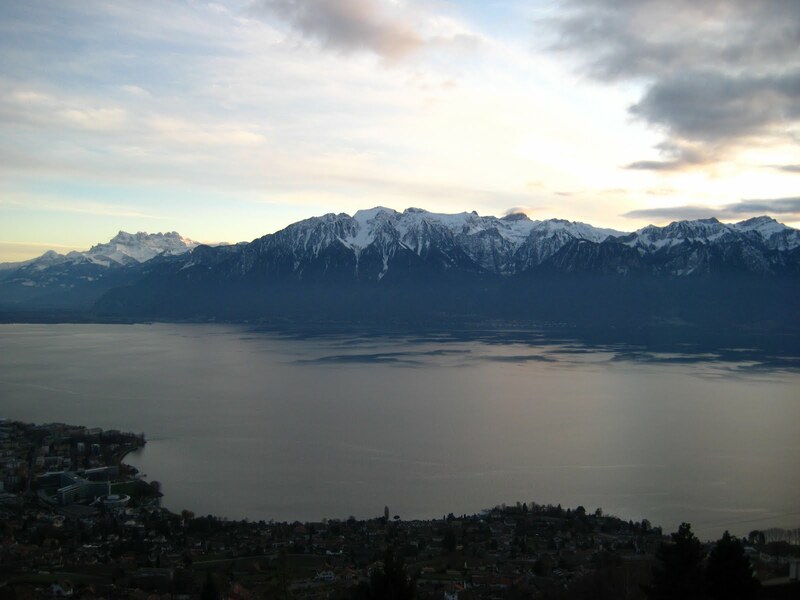 Montreux is home to the famous summer jazz festival and also the Clinique La Prairie where the famous (or infamous) submit to thalassotherapy, skin treatments or a weight-loss program as well as aesthetic surgery. We had lunch in the middle of town then went for a walk on the boardwalk which at this time of the year is the venue for the annual winter Christmas market. – Marche de Noel. We walked through the first row of stalls selling trinkets and Christmas items then crossed over to the other side where the food stalls were set up. Right by the lake was a large covered area filled with benches and large wooden tables for an impromptu picnic of food items purchased from the many stalls. 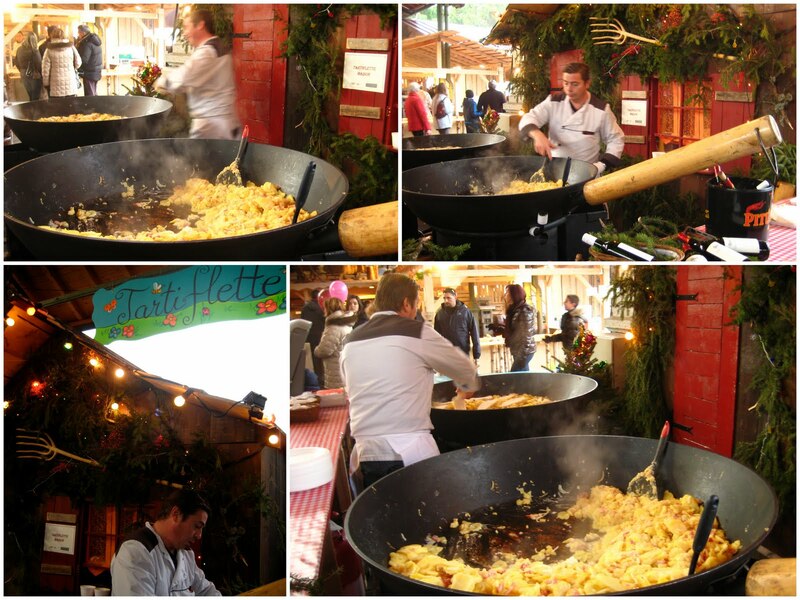 The one we were drooling over was the Tartiflette stand where two gigantic (really! look at the photo above) pans were filled with a lovely scent of potatoes, chopped bacon and hot gooey chunks of Reblochon. If I hadn’t just had lunch, I would have had a plateful of this perfect winter dish. Good thing that the parking entrance was nearby or I wouldn’t have been able to resist the other stands selling saucisson sec, pastries, tarts, cheese and lots of other goodies. Next, we dropped by St. George’s School – where both my nephew and niece go before heading up the hill towards the Le Mirador Kempinski which has fantastic views of of the lake and the snow-capped Alps. We walked around the terrace and enjoyed the scenery until it got too cold to stand around outdoors and headed back home. J drove us back to the train station where we said a quick goodbye on the quai (platform) and hopped on the train back to Geneva. A relaxing day spent with family to end our weekend in Switzerland.